Rob Damiani is love. Rob Damiani is life. Wessex Ranger first, Business Management student second. Imagine Dragon’s openers Sunset Sons talk plans for the future with Will Scot. Will takes us through Don Broco’s sophomore album, Automatic. 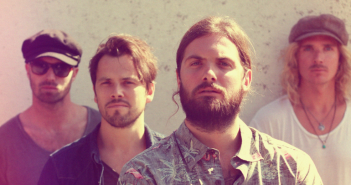 Will takes a look at the latest offering from Sunset Sons, ‘She Wants’. The Edge talks tour highlights, future ambitions and Bovril with the Don Broco frontman. Will reviews the latest track from Don Broco’s upcoming second album. Will Scott reviews the latest track from Bedford boys Don Broco. In light of the election, here at The Edge we are celebrating our favourite political and protest music from the last century. Will explores one of the most influential rap albums of all time. 14 years ago today, on February 11th 2001, OutKast’s hip-hop classic ‘Ms. Jackson’ hit the top of the US charts. Don Broco stormed Southampton’s own Guildhall on the triumphant Kerrang Tour. Lower Than Atlantis intend to raise the roof on their 11 date UK tour, with support from We Are The Ocean and PVRIS.